Sunny Isles Beach, while a city with sky-high luxury hotels & condominiums, has many beautiful, green and spacious parks for recreation. 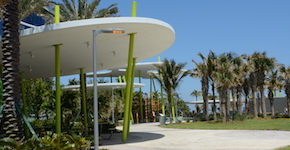 An oceanfront park is home to beach yoga and live music, while Heritage Park is a 4-acre recreation area with two playgrounds, a stage for music and concerts, a water play area, dog park, and large open lawn. Gateway Park recently opened and features a large stage for live concerts every month, a modern playground for kids, fun water feature and large open green space. Senator Gwen Margolis Park houses a soccer field and playground, as well as a leash-free dog park and picnic tables. The popular Town Center Park includes a playground, fitness trail, and gazebo, and much of the area is state-protected wetland. 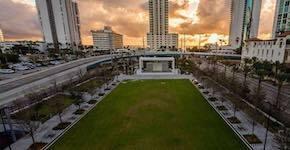 This is just a few of the many parks available to the public in Sunny Isles Beach, whether you want to go for a walk or take the kids to the playground, we have many options throughout the City!